Rev. 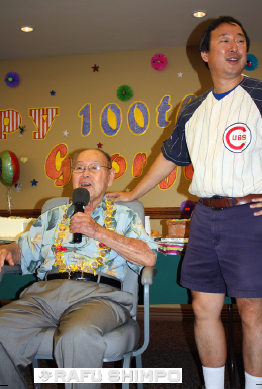 George Aki, 442nd RCT chaplain, celebrates 100th birthday. CLAREMONT — Rev. 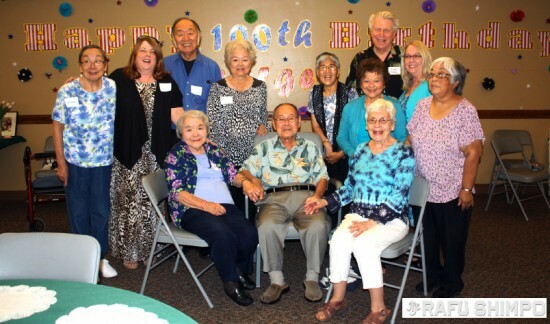 George Aki celebrated his 100th birthday on Sept. 13 with a gathering of more than 100 family and friends at Pilgrim Place, a community for retired clergy in Claremont. Aki sat serenely in a chair in front of the gathering as well-wishers came up to greet him. “I want to say thank you, and thanks to everyone who was so good and so wonderful to me all these years,” Aki said. A large contingent from Hollywood Independent Church, where Aki served as pastor emeritus, joined in the celebration. Pastor John Varga said that the congregation often speaks fondly of Rev. Aki. “The things that I hear the most is that he taught the community here of having God as center. And he really focused on the wider mission, making sure that people tithe and make sure that people gave money to help others even outside our local neighborhood. He was very adamant about that,” Varga said. Aki’s charitable activities included raising $8,000, a record amount, for Habit for Humanity during a fundraiser. Aki was born Sept. 11, 1914 in Livingston, Calif. and grew up in Fresno, the second of three brothers. In March 1944, he volunteered to join the 442nd Regimental Combat Team and was the last chaplain to serve the unit, attaining the rank of major. Among his first duties when he arrived in Livorno, Italy was to seek out and care for graves of soldiers that were hastily abandoned amid the chaos of combat. He would look for the dog tags that identified the young soldiers. In Europe, Rev. Aki gained a lifelong appreciation for the sacrifices of the Japanese American soldiers of the 442nd RCT, 100th Battalion and the Military Intelligence Service. His 30 months overseas also left him with an aversion to pasta, according to his son Jim, who served as emcee. Jim “Junwo” Yamashita from I Company and Mitsuo Kunihiro from E Company were in attendance. Rev. Dickson Yagi and Rev. Saburo Masada, and his wife Marion, were also at the celebration. Masada called Aki his hero, noting that as chaplain for the 442nd, he stood up for the Nisei soldiers when he saw that they were being treated poorly by their commanding officer. “He was witness to mistreatment and he did something about it by writing to the top Chaplain in Washington, D.C. He was not afraid to call attention to mistreatment and injustice,” Masada said. Rev. 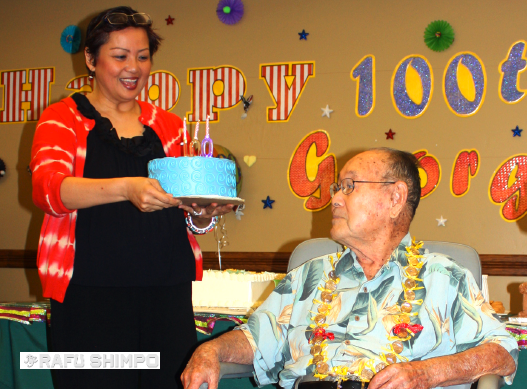 George Aki looks on as Anna Aki, wife of his son Jim Aki, presents a birthday cake.